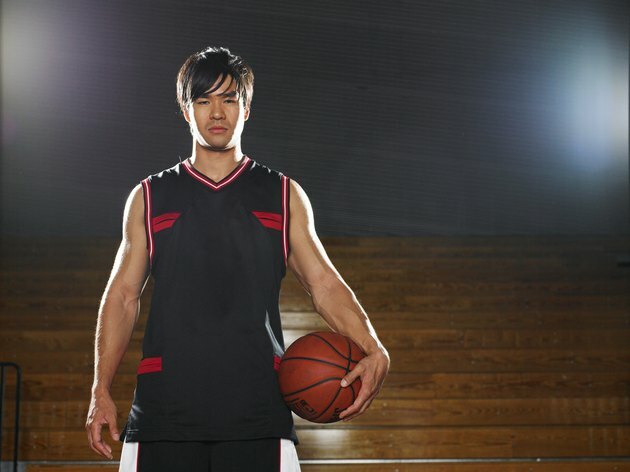 Basketball players tend to be tall, thin athletes because their height helps them to reach toward the basketball goal and defend the ball against opponents. Male professional basketball players tend to be about 9 inches taller than the average American male, according to NBA.com and Dr. Steven Halls on Halls.MD.com. Height tends to accompany other important features for a basketball player, including arm reach and hand span. Professional basketball players must be tall to be competitive in the league. In a survey of the average heights of professional basketball players in 2007 to 2008, the average height of a basketball player was 6 feet, 6.98 inches tall, according to NBA.com. The tallest basketball player was Yao Ming, who is 7 feet, 6 inches tall while the shortest basketball player was Nate Robinson, who is 5 feet, 9 inches tall. Considering that the average height of an American 25-year-old male is 5 feet, 10 inches tall, height is important in playing basketball, according to Halls.MD.com. The closer a person is to the basketball goal in height, the more accurate the shot can be and the less force you must apply to propel the basketball into the basket. Regulation height for a professional basketball goal is 10 feet tall. This is one of the reasons why basketball players must be tall. When playing offensive positions, being taller helps your reach to the goal. If you are playing against taller defensive players, being taller can help you shoot the ball without risk of a player swatting the ball away from you. In basketball positions, the center must play both defensive and offensive positions. The center also tends to be the tallest player because added height contributes to longer wingspan and reach. The two guard positions tend to be the next tallest while the two forwards are smaller because they must make fast breaks to shoot the ball. When playing defensive positions, added height and reach helps you to block shots and battle for rebounds. Taller basketball players with longer arms have to reach less further to grab the rebound. What a basketball player gains in leverage thanks to his height, he may lose on other aspects including speed and agility. Shorter players are lightweight, which increases their speed when moving across the court. While taller players may have longer legs, they must put forth more effort to propel themselves forward. Also, those with longer legs can be clumsier and require more coordination than a shorter basketball player. Sports Tips Etc. : Are You Using a Regulation Basketball Hoop? Does Height Matter in Running?